(1) The contract referred to in said action is hereby cancelled. (2) Concurrently herewith, plaintiffs in said action have delivered to defendant in said action a dismissal with prejudice, to be filed by defendant forthwith. (3) LAUREL and PRODUCTIONS, jointly and severally, release STUDIOS from any and all claims which they or either of them have against STUDIOS, except claims under the agreement hereinafter mentioned. STUDIOS hereby release LAUREL and PRODUCTIONS, and each of them, from any and all claims which STUDIOS has against them, or either or them, except claims under the agreement hereinafter mentioned. (4) Concurrently herewith, STUDIOS has paid LAUREL the sum or five thousand dollars ($5,000.00), and concurrently herewith STUDIOS is delivering to Benjamin W. Shipman a note in his favor, 'for thirty-five thousand dollars, which said note is delivered to said Benjamin W. Shipman as a part of the settlement of said litigation and in consideration thereof. Nothing hereinbefore contained shall be deemed to be a release of said note. (5) STUDIOS agrees that no claim, defense, judgment or other matters affecting Stan Laurel may be used as an off-set, counter-claim or defense against said promissory note for thirty-five thousand dollars ($35,000.00), and said note will be enforceable no matter what the disposition may be of the contract mentioned in the next succeeding paragraph. (6) Concurrently herewith, STUDIOS ha entered into an agreement with LAUREL, dated April 8th. 1939, for the performance of services by LAUREL for the STUDIOS for a term of one (1) year. There is now pending action # 434444 in Superior Court of State of California, in and for County of Los Angeles, entitled: Stan Laurel and Stan Laurel Productions, Inc., a corporation, Plaintiffs, vs. Hal Roach Studios, Inc., a corporation, Defendant. The parties desire to compromise that litigation and to that end agree as follows: 1) Contract referred to in said action is hereby cancelled. 2) Concurrently herewith, plaintiffs have delivered to defendant a dismissal with prejudice, to be filed by defendant forthwith. 3) Laurel and Productions and studio hereby release each other from any and all claims, except claims under agreement hereinafter mentioned. 4) Concurrently herewith, studio has paid Laurel $5,000 and concurrently is delivering to Benjamin w. Shipman a note for $35,000 as part of settlement of said litigation and in consideration thereof. Nothing hereinbefore contained shall be deemed a release of said note. 5) Studio agrees no claim, defense, etc., affecting Stan Laurel may be used as off-set, counter-claim, etc., against said promissory for $35,000, and said note enforceable no matter what disposition may be made of contract. 6) Concurrently, studio has entered into agreement with Laurel dated April a, 1939, for performance of services by Laurel for studios for term of one-year. BEVERLY HILLS, CALIF (April 25, 1939) — Even a third marriage—to the same wife—failed to go off perfectly today for Stan Laurel. First, the screen comedian’s Russian bride, Countess Illeana, was late, due to an appointment with the hairdresser. Then the priest was detained. And finally the marriage rings failed to arrive—until after an embarrassing wait. Father Leonid Znamensky of the Russian orthodox church, of which the bride is a member, performed the ceremony, clad in ceremonial vestments. The ancient Russian rituals were performed, the Laurel’s drinking from a wing goblet, going through a double ring ceremony, and marching around an improvised altar while attendants held crowns over their heads. 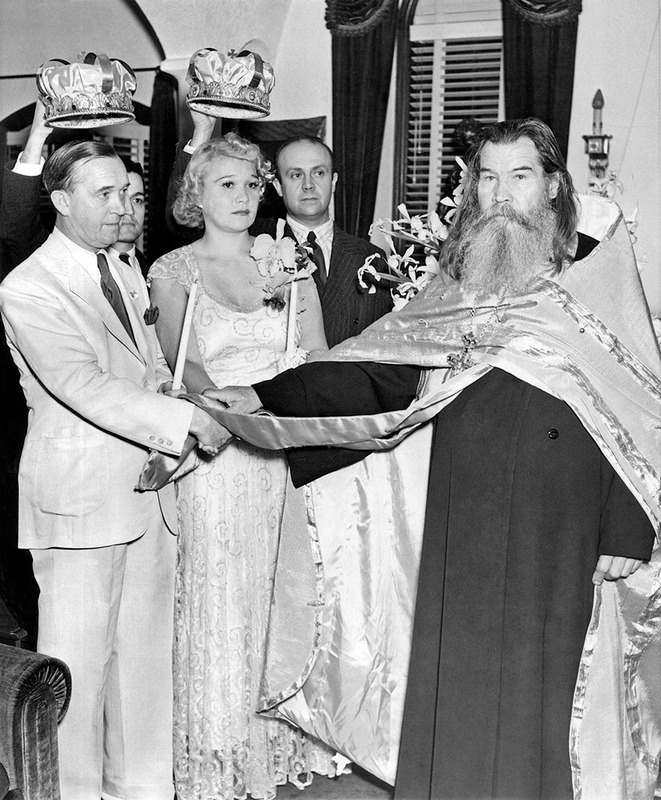 PHOTO SHOWS: L-R Stan Laurel, Sergei Temoff, holding crown over groom’s head, Mrs. Stan Laurel, Serge Malavsky, holding crown over bride’s head, Father Leonid Znamensky, circling the altar during the wedding ceremonies. Hal Roach Studios, Culver City, Constance Bennett, $40,000; Cary Grant, $60,000; Oliver Hardy, $101,200; Patsy Kelly, $43,199; Stan Laurel, $75,000; Norman Z. McLeod, director, $70,000; Hal E. Roach, president, S104,000; Lyda Roberti, deceased, $22,350; Roland Young, $26,666. HOLLYWOOD—The reunion of the screen comedy team of Stan Laurel and Oliver Hardy was reported near today as Mr. Laurel, the sad-faced member of the duo, settled a suit which blocked him from making peace with Hal Roach Studio. Superior Judge Thomas C. Gould approved a stipulation dissolving a court order under which Mr. Laurel’s wife, Illeana, had prevented the comedian from reaching a settlement with the studio until her separate maintenance suit was heard. Reports had been current for some time that both Mr. Laurel and Producer Hal Roach were anxious to settle their differences so that the team of Laurel and Hardy could resume work in a series of short comedies. 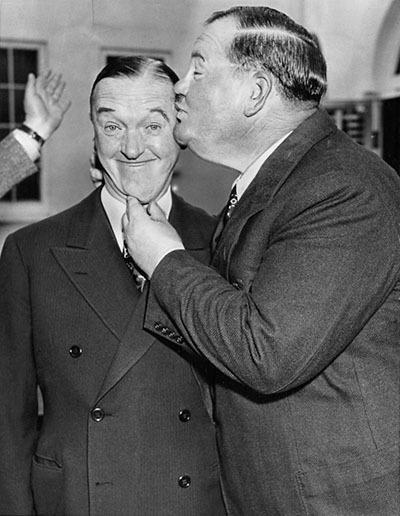 Oliver Hardy plants a kiss on the cheek of fellow comedian Stan Laurel, after signing up to resume their film activities together. After finishing this picture, Laurel and Hardy will appear in pictures for Hal Roach, their former producer.